Professional and reliable on AA/AAA/C/D/18650/18500/16340/26650/20650/9V/Cordless Phone Rechargeable Batteries and Battery Chargers. * High performance, up to 1,000 rechargeable cycles. * Precharged 15%~20% of capacity by solar energy. Could be used when you get it. 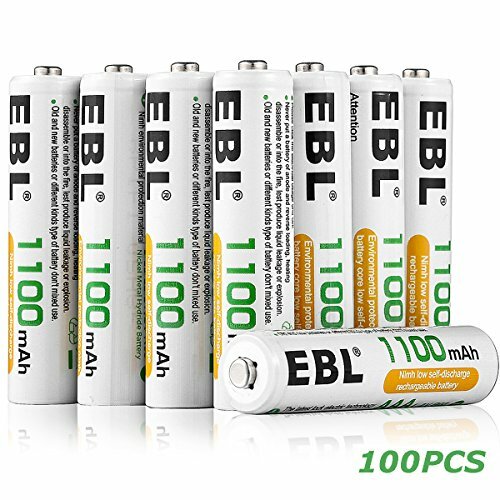 * Excellent charge/discharge performance, the batteries will keep a high quality after 3-5 times charge & discharge when used in the first time or long time no used. * Longer life in the high drain devices than normal Alkaline batteries. * Doesn't contain Hg/Cd/Pb, no pollution to the environment. * Great for high power demand devices such as digital camera, children' toys and so on. * Durable case, convenient for storage and taking on the go. Low self-discharge batteries will remain 85% juice when you leaving it for no use 1 year. Durable storage case included, providing a better protection while shipping and daily storage. Warranty: 30 days worry-free money back and one year limited warranty.